As you've no doubt heard, the U.S. tax code got a major overhaul with the new Tax Cuts and Jobs Act. So what does that mean for the return you're filing right about now? It means you may not be able to take some deductions from the old tax code that saved you major bucks in the past. Ouch! But it's not quite as bad as you might think. Many tax breaks haven't disappeared completely; rather they've just morphed a bit, redefining who qualifies and for how much. To clue you in to these new rules, here's a rundown of five major tax breaks that have changed this filing year, and who still qualifies for them. You may have heard a rumor that the home office tax deduction went the way of the dodo. Yes, the deduction is gone for W-2 employees of companies who work in a home office on the occasional Friday. 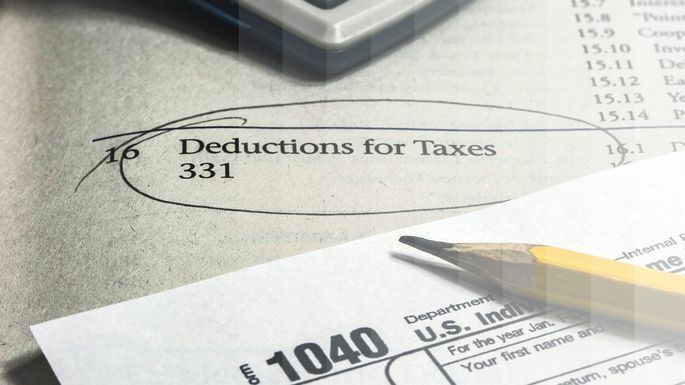 "For non-self-employed people, the home office deduction is going away entirely," says Eric Bronnenkant, certified public accountant, certified financial planner, and Betterment's head of tax. The loophole: If you're self-employed full time, this deduction lives on. Here's more info on how to take a home office tax deduction. One of the biggest changes for homeowners in the new tax bill is the cap on deducting property taxes. "Before, regardless of the amount, all property taxes were tax-deductible," explains Bronnenkant. Yet this season, "the maximum you can deduct is $10,000, and that includes state and local income tax, property tax, and sales tax." So if you pay more than $10,000 a year between your state and local income taxes, property tax, and sales tax, anything exceeding that amount is no longer deductible. This is something to keep in mind as homeowners consider tax benefits of their current or future home. The loophole: "It is worth noting that this limit applies to a taxpayer’s primary, and in some cases secondary, residence," says Bill Abel, tax manager of Sensiba San Filippo in Boulder, CO. "But it may not apply to rental real estate property." Why? The $10,000 overall tax limit is applied on Schedule A as an itemized deduction, which would have no bearing on the tax deduction for a rental property on Schedule E. So if you're a landlord, your deduction could edge past that $10,000 limit; make sure to max it out! If you moved in 2017, lucky you: You are the last to take advantage of the ability to deduct your moving expenses. The loophole: Active members of the armed forces who moved (or move) after 2017 can still take this deduction, according to Patrick Leddy, a tax partner at Farmand, Farmand, and Farmand. One major change for homeowners who purchased a house after Dec. 15, 2017, is that they will be allowed to deduct the interest on no more than $750,000 of acquisition debt—that's a loan used to buy, build, or improve a main or secondary home, says Abel. This is in contrast to the $1,000,000 limit on acquisition debt, which still applies to existing loans incurred on or before Dec. 15, 2017. The loophole: Homeowners who refinance their debt that existed on or before Dec. 15, 2017, are generally allowed to maintain their $1,000,000 limit from the original mortgage. A home equity loan is money you borrow using your home as collateral. This "second mortgage" (because it's in addition to your original home loan) often takes the form of a home equity loan or home equity line of credit. Traditionally, the interest on these loans could be deducted up to $100,000 for married joint filers and $50,000 for individuals. And you could use that money to pay for anything—college tuition, a wedding, you name it. But now, home equity loan interest is deductible only if it's used for one purpose: to "buy, build, or improve" your home, according to the IRS. So if you're dying to update your kitchen or add a half-bath, you'll get a tax break from Uncle Sam. But if you want to tap your home equity to go to grad school, well, that's on you. More bad news: Unlike the mortgage interest deduction—where loans taken before Dec. 15, 2018, could be grandfathered into the old laws—home equity loans have no such exemption. People with existing HELOC debt take the hit just like homeowners applying for one now. The loophole: To reclaim this deduction, you could refinance your second mortgage and your first into a new mortgage that lumps together both debts. This essentially turns your HELOC into a regular mortgage, which means that you can deduct that interest. Just remember that refinancing can be costly, and that this new loan will be subject to the new, smaller limits on deducting mortgage interest—$750,000. Worried about losing all of these deductions? Don't freak out! Though the new tax plan is drastically changing how most people will file their taxes, it doesn't necessarily mean that you will end up owing more. Deductions may be dropping, but so are the tax rates for most income groups. And the standard deduction grew to $24,000 for a married couple filing jointly. So, it may all balance out.